Sports Community founder, Steve Pallas, hosts a series of 6 self-paced online training sessions. 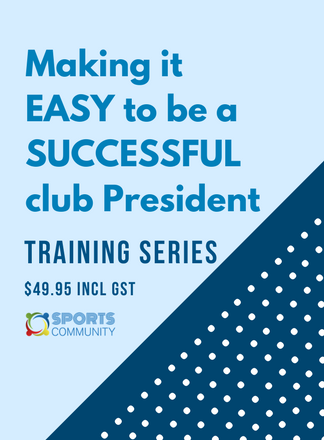 The on-demand training provides a step by step guide on the simplest, easiest and most enjoyable way to become a successful sports club President. Sports Community created the online training series “Making it easy to be a successful club President” to empower sports club Presidents. We will show you how to eliminate these negative experiences and empower you to lead your club effectively. And most importantly, to allow you to enjoy your time in the role. I don’t have enough time to do the training!! Time is the scarcest asset of a sports club President, so why would they spend a second on this course? Simply because it has been designed to save them huge amounts of time, stress and frustration. In our travels, we have learned that successful clubs share a common trait. It is that is they have created a culture of volunteering where club members make themselves available to help out. And while you will learn many new skills during our six-part training series, the core outcome will be that we will show you step by step, how to create a culture of volunteering at your club. That’s right, we will show you, step by step, how to get everybody in your club helping and contributing to the running of the club and its long-term success, year after year after year. What do you get when you join the “Making it easy to be a successful club President” six-part training course? Now you’re the president, where do you start? Understanding your Club – What needs to be done? When? How and who can do it? What the terms leadership, culture and club success actually mean to you as a leader and how they can be applied to your club? Each session is accompanied by a workbook with an exercise at the end to undertake at your club. NO this is not homework, it is part of us guiding you step by step on how to implement what you have learned into your club. To ensure we support you all the way through the journey as a sports club President, we have created a private Facebook Group for course attendees. They can ask questions directly to both Steve, your course facilitator, and to other participants in the training program. This Facebook community will become a great networking resource for you during and long after you finish the training course. You will also get regular Sports Community newsletters providing you with the latest club information, news, fundraising ideas and resources, all of which will make your role of President easier and more enjoyable.